Sebastian Blanco has been the MVP for the Timbers so far in 2018. 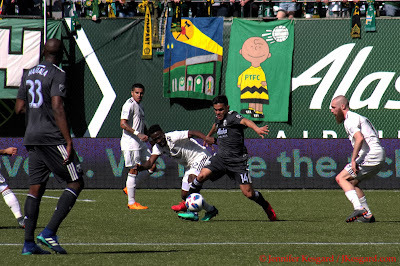 For those long time fans of the new blog here, you might realize it's not Wednesday and therefore I missed the usual posting time for looking back on the Portland Timbers big win over New York City FC back on April 22. Anyone paying attention here, I try and follow a somewhat regular schedule for postings schedule permitting: for weekend home matches, Monday night is match recap, Tuesday night is reserved for Jennifer's snarktography, Wednesday is analysis and Friday is preview and predictions. That should give four solid posts full of information, drivel and assorted cat photos for those paying attention, but as we all know, life sometimes put hard hurdles within the schedule. Monday nights are my night for group, so depending on how drained I am after dealing with shadows and other assorted things like that, the Monday post might punt into another day. In this case, Portland got themselves another break in the schedule before they travel southward to San Jose on Cinco De Mayo. Getting a break now is likely a good thing considering what May brings in terms of matches: at San Jose, vs. Seattle, vs. LAFC, at Colorado (physical match on weird surface, fierce rivalry match, unknown quantity, club that plays well at home & Timbers have struggled). After seven matches sporting a 2 win, 2 draw, 3 loss record, we can safely say that we've seen everything from the Timbers at this point: compelling soccer, whirling about, confounding mistakes, lovely goals, lockdown defense, poor communication - essentially a team that is trying to find themselves under a new coach taking them in a different direction. Gone are the days of working in a "precise" system using a stable formation and approach - Gio Savarese wants a team that will display the ultimate flexibility in approach and tactics to provide the biggest potential challenge to their opponents. As we talked about in the NYCFC recap, we've already seen several approaches to the lineups and the results have been varied, but improving. 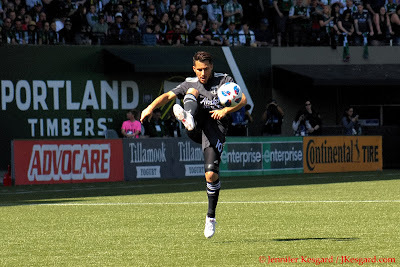 The Portland side versus NYCFC was not only one of the most composed and tactical I've seen in a while, but they dealt with the various challenges in a professional and precise manner that it was downright fun to watch. Yet, I had to temper my excitement with the realization that this was just one match and that there would be upcoming challenges to deal with - and the formation choice here worked, but there would be updates each and every week. This was as organized of a Timbers defense as I've seen for a while. Which really plays to some of the strengths and weaknesses I see in this new "flexible" approach. Obviously teams can't play the same eleven each week within a 34 match season with breaks and other competitions, so there will always be some turnover in the available players, so the flexible approach allows building for strengths on who is available. It also adds unpredictability for the opponent, who has to speculate who or what they might face when the Timbers line up to play. Adjustments can be made relatively easy as situations warrant as well, so what's the downside? How about building up consistency within positions and tactics - a constantly moving lineup might require different approaches for players, and that could lead to unforced errors. There is strength in building a consistent approach and honing this to pure precision while forcing the opposition to find ways to attack something known, but that can also be unwiedly at times. If you have committed professionals, a coaching staff that can communicate expectations, and an approach that can keep everyone engaged, flexibility works. 1. Synchronicity In Motion: Playing a system like the team did versus NYCFC that gave them the bulk of possession required a team pledge to stay within their roles and fully commit for the full 90. Without a doubt, we saw the Timbers follow this to the letter of law, even after making their substitutes. 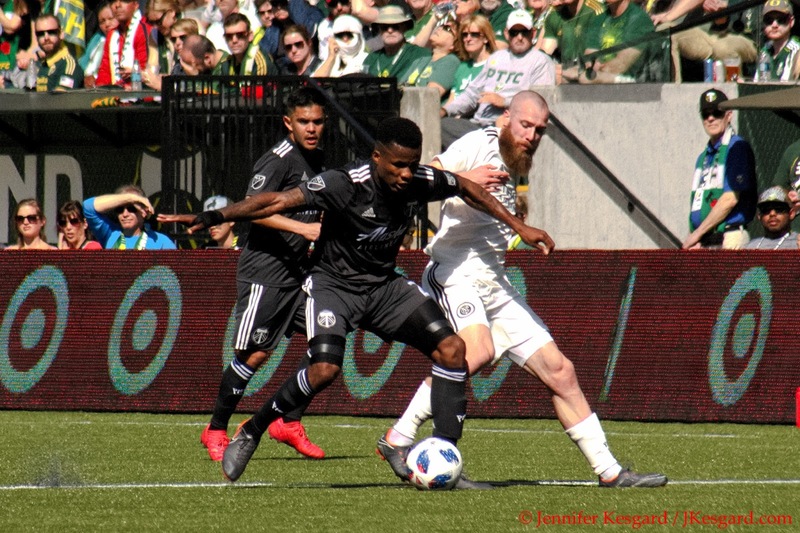 Sometimes, a player change can disrupt the flow, but every Timbers player was dialed in and on point. 2. Defensive Communication. While the sync play was very good, it was also very apparent that the backline was very well organized. In talking with my wife, Jennifer, after the match, she observed from her pitchside post that there was lots of yelling between Jeff Attinella, Liam Ridgewell and the rest of the defense. Everyone was pointing out marks or space, and adjusting within the scheme to make sure every threat was covered. NYCFC did have their chances, but they weren't without coverage or duress, and that was a sight to see. 3. Sebastian Blanco. 2017 was the year that every Timbers fan wondered how much more could Diego Valeri do to impress the hometown crowds with his precision play and scoring. For this season, the Maestro continues to do his thing, but he's been joined by the efforts of Blanco, who currently leads the team in goals scored. He's also done it with precise shots, looping headers, efforts off the set piece, against the run of play - Blanco has been locked in and the offense has been better because of it. Andres Flores performed very well in the start for Portland. 1. Okay, Now What? Portland was that impressive against NYCFC, and it was a sight to see, but it means absolutely nothing if this team goes to San Jose and completely implodes. While I'm not expecting that to occur, I wasn't exactly seeing a Timbers side being run out on the road against a New York Red Bulls side that was talented and young, albeit very raw. The good vibes from this win won't mean much if the Timbers don't show well against the Earthquakes; I'm not calling a must win at all, but I'm saying that after the matches in Chicago and Orlando, Portland needs a shining result on the road. 2. Position Battles Are Looming, So Be Prepared: I saw plenty of tweets lauding the effort of Attinella, and indicating he should start for the rest of 2018. This was followed up by pro-Ridgy tweets, Zarek Valentin likes and so on, but there is still a lot of season left and I expect we will see a regular rotation and even healthy players might sit due to Savarese's formation choices. Being engaged as a team means seeing the eventual long term goals of success in the postseason and another MLS Cup, so it will be important for players to keep that in mind as the calendar moves towards the summer. 3. 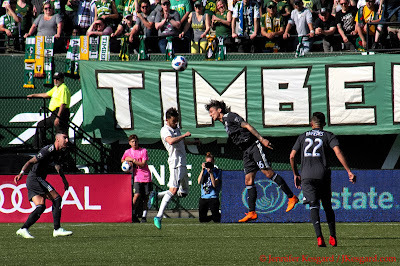 Schedule Pileup: For those fortunate souls that were able to take in 2 Timbers matches, 2 Thorns matches and 2 Timbers 2 matches between April 14 and April 22. I hope your soccer sensibilities weren't too overwhelmed. That's a lot of fixtures compressed within a timeframe, and it reminded me of the old Thursday night/Saturday night schedules of the Timbers back in the USL days. I had barely recovered from Thursday's adventures to then realize it was time to get back at it on Saturday, but at the same point, it's just great to have the teams back home for a spell. GK Jeff Attinella (90 minutes): 8. Made the saves when needed. commanded his line when he needed to, and came away with the team's first clean sheet of 2018. D Zarek Valentin (90 minutes): 6. Played stout when needed with Powell playing more forward for most of the match, but held up reasonably well for the full 90. D Larrys Mabiala (90 minutes): 7. No glaring mistakes and earned his first MLS goal off a lovely header off a corner. D Liam Ridgewell (90 minutes): 7. Maligned defender steps up huge and put in one of the best shifts I've seen, including a stone cold block on David Villa late. D Alvas Powell (90 minutes): 5. Did his job well and helped the offense when needed, but was able to support the defense late in dropping back. M Andres Flores (89 minutes, replaced by Dairon Asprilla in stoppage time): 7. Utility player extraordinaire gets the start and shows he can play a strong, smart wing outside and earns an assist for the match. M Dairon Asprilla (1 minute, brought on for Flores): 5. Good work to help run down the clock for the Timbers to post the impressive win. M Diego Chara (90 minutes): 7. Smart, composed play all afternoon - just what the Timbers needed. M Cristhian Paredes (90 minutes): 6. Okay, there were glaring errors at points, but the teenager is really showing well so early in his career. M Diego Valeri (78 minutes, replaced by Andy Polo at the 78th minute): 6. His service on the Mabiala header was outstanding, and I thought it was exactly we expect to see from Valeri. M Andy Polo (12 minutes, brought on for Valeri): 5. Helping run down a match is a hugely important task for young players, and I thought Polo was very composed yet provided some good danger to keep NYCFC honest. M Sebastian Blanco (90 minutes): 8. I am still trying to figure out how he jumped that high on his first half header. Seriously, the man has some hops. F Fanendo Adi (85 minutes, replaced by Samuel Armenteros): 6. Right place at the right time to get goal number 2, but he helped keep NYCFC defense honest all match. F Samuel Armenteros (5 minute, replacing Adi at the 85th minute): 5. Earned a good look or two late, and held a ball in the corner to run down some clock - always good late match strategy. Coaching Staff: 9. I didn't think the starting lineup would do what they did to NYCFC, but I was dead wrong. Outstanding result, and well deserved kudos to Gio and his staff. Overall Timbers Score: 9. It's still impressive days later. Predictions are back next week with San Jose! Each week, 2 analysts from our group of soccer experts will face off against me and 2 of our cats to predict the events for the upcoming matches. If you would like to be part of our crew of analysts, please email pdxtimbersblog@gmail.com; I will include you on the email list for predictions. To keep things very simple, I'm asking each analyst for only 3 to 4 sentences (about 100 words) and a photo for inclusion. We will track the results at the end of the year to see who knows more about soccer: me, the analysts or our cats. Team Tortie is already predicting a plethora of goals for 2018.